Do you need to buy a shipping container in North East England? We have a wide variety of shipping and storage containers for sale in the North East England areas of Tyne and Wear, Northumberland, County Durham and Teesside. For further information regarding cost and delivery, please contact us and a member of our team will be in touch. Lion Containers Ltd supply shipping containers for sale, for a a variety of purposes including domestic and business storage, as well as for conversions and accommodation. 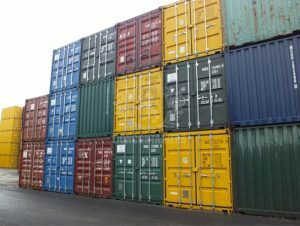 Our standard new and used container sizes are 10ft, 20ft and 40ft but we can provide any size from 7ft to 45ft. We can source and deliver your container quickly and economically to the North East England areas of Northumberland, County Durham, Tyne and Wear and Teeside. The savings we make on delivery from dispatching your container from your local depot are passed on to you. We converted a 40ft container into a heavy process machinery storage container for a Yorkshire company, they required this for shipping also. We were in need of a new container to use as an overflow storage facility. Lion Containers provided a great price and a great quality container. We will definitely use them again if we need another container in the future.